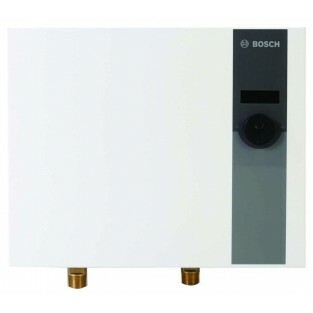 The Bosch Tronic 6000 C WH27 is ideal for replacing your electric storage tank water heater. The Bosch Tronic 6000 WH27 electric whole house tankless water heater is compact and powerful and can installed virtually anywhere inside the home. Advantages include endless hot water, reduced electricity costs and substantial space savings. This new model features a digital display and a thermostat control on the front of the unit. Designed to replace a 40-gallon electric tank. The Bosch Tronic 6000C WH27 electric tankless water heater is built to last. It has solid copper heat exchangers and brass fittings. A thermal cut-out switch provides an excellent safety measure and ensures that the heating elements will not need replacement, as they do with many other electric tankless water heaters. This small unit can be installed virtually anywhere in the home and, of course, produce an endless supply of hot water. The Bosch Tronic 6000C WH27 is the direct replacement for the Bosch Tronic 5000 C WH27 and it also replaces the older Powerstream Pro RP27PT and the Bosch PowerStar AE125.  Weight - 22 lbs.  Dimensions - 12½" x 15¼" x 4½"
Average ground water temperature in the United States is 55ºF. NOTE: The unit will not provide an output temperature above 131ºF. ** In Canada unit must be wired to a single breaker. AE Canada Kit required. Always check local codes. The Bosch Tronic 6000 WH27 is the replacement for the Powerstream Pro RP27PT and the Powerstar AE125. Please note that the older Powerstream Pro RP27PT and the Powerstar AE125 electric tankless water heaters were 15.5 x 15.25 x 4.5 inches while the Bosch Tronic 6000 Model WH27 measures 12.5 x 15.25 x 4.5 inches, just like the Bosch Tronic 5000 WH27. The water connections on the Bosch Tronic 6000 Model WH27 are also off slightly from the older model heaters. The Bosch Tronic 6000 Model WH27 has serial numbers that begin with 555 and higher and the PCB replacement part number is 8-738-710-922.